Another jam we made last week was a seedless raspberry nectarine freezer jam (recipe from Kitchen Simplicity via Simple Bites). The flavor of the nectarines really complimented the raspberries. It did not set quite as firmly as some other jams, but that was perfect on these pancakes! Next year I will definitely make this jam again, but I will try to make it lower sugar and as a regular canned jam, instead of a freezer jam. I love these freezer containers from Ball! Perfect for jam. Little A wanted pancakes with jam and sausage for his birthday breakfast on Thursday. 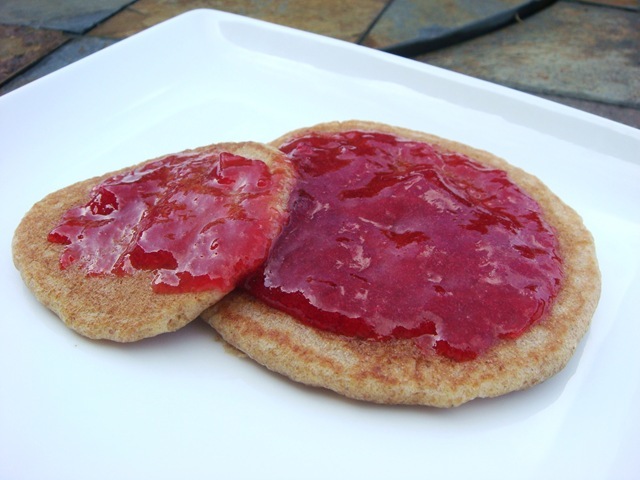 This sweet jam was a perfect topping for these healthy, but delicious, pancakes. 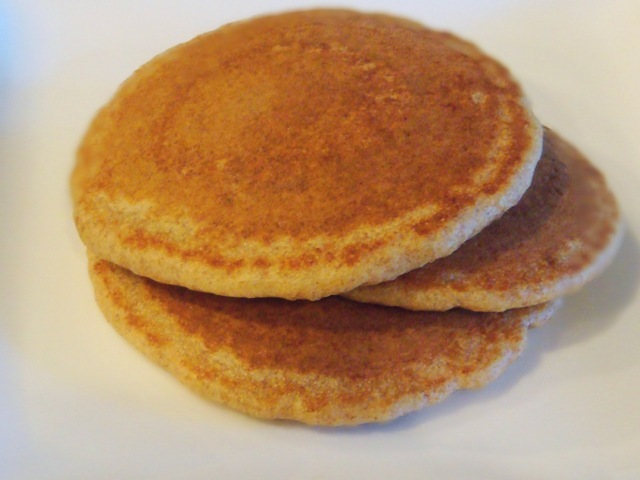 I make these pancakes with kefir and whole wheat berries, blending them and then letting the mixture sit overnight. A quick blend again in the morning with an egg and some leavening, and they were ready to throw on the griddle! They can also be made all in the same day, but the batter thickens up more if it is allowed to sit. For a slightly different flavor, try using other grains; often I will add some whole oat groats in place of part of the wheat. Use a blender or food processor to puree nectarines and raspberries. Strain through a sieve to remove seeds. Add lemon juice and 2 cups sugar; let sit 10 minutes. Stir water, pectin and 2 cups sugar together in a small saucepan. Bring to a hard boil; boil for 1 minute. Stir into fruit mixture for 2 minutes or until sugar is dissolved. 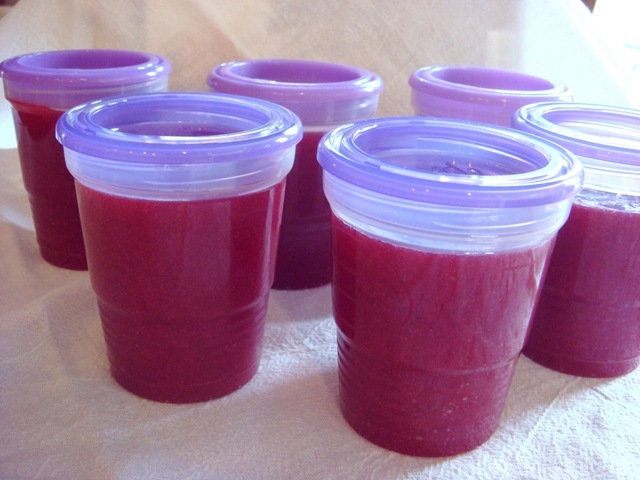 Spoon into freezable containers and allow to sit, sealed, at room temperature until set (up to 24 hours). Store in the fridge for 3 weeks or in the freezer for 6 months. Combine wheat berries (or other grains) and kefir (or buttermilk or milk) in a blender. Blend for 2-3 minutes. Let the mixture of grain and milk sit on the counter for 1 hour or overnight (refrigerate if using regular milk). After letting the mixture sit, blend the grain/milk mixture again for about 1 minute. While blender is running, add the egg and melted butter. Add baking powder, salt, baking soda, vanilla and sweetener and blend just until combined. 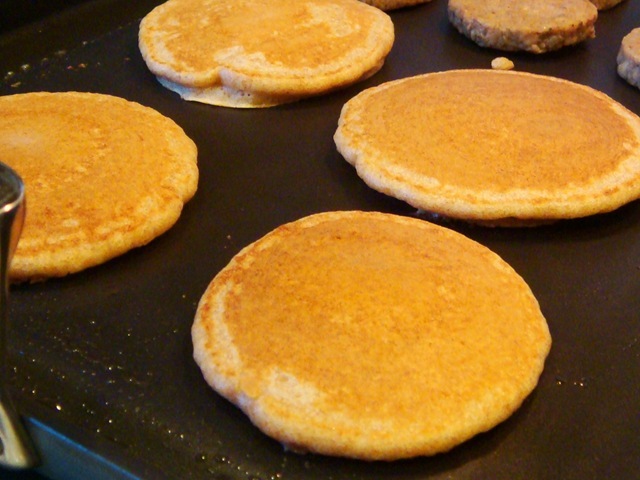 Cook pancakes on a hot griddle.